Summer months are the fun months of the year — filled with traveling, birthday parties, water-fights, gardening, and beautiful warm weather. That’s what our summer looks like at least… and August is our peak summer month. It was a crazy busy month. We had tons of fun, and it showed up in our expenses this August! We spent a HUGE amount of money, but none of it was unexpected. Every once in awhile we have a very expensive month, and August was one of those! We really blew past our regular budget numbers in August! Expenses came in at a crazy-high $8,743.49. Woah! That’s around 50% higher than usual! Where exactly did we spend it all, and why was it so much higher in August? Our Food costs were slightly higher in August at $596. This is roughly $100 higher than we usually spend in any given month, and I attribute the added expense to eating at restaurants during our Eastern Washington road trip. We ate 3 meals in restaurants for the month of August. Our August food expenses were higher than normal. 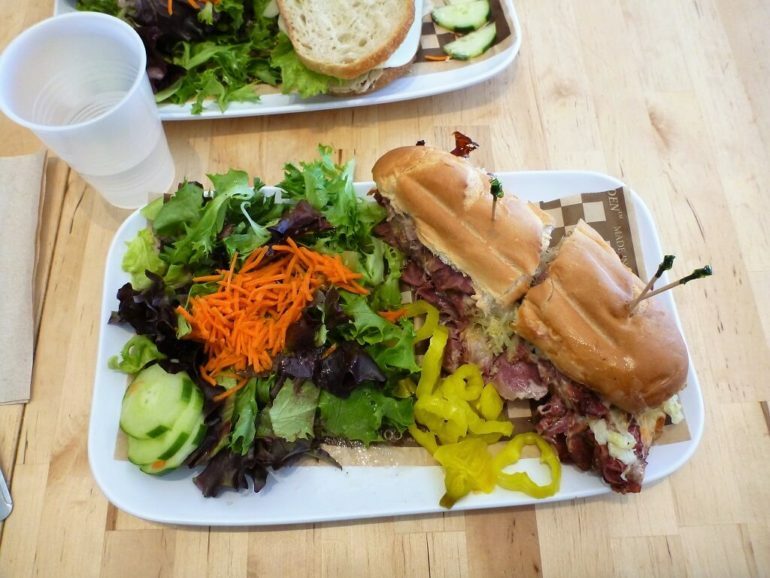 As a consolation prize, I got to eat this ridiculously good pastrami sandwich. Don’t worry — we also did plenty of eating at home during the month of August! Did I mention we had a homemade sushi night? 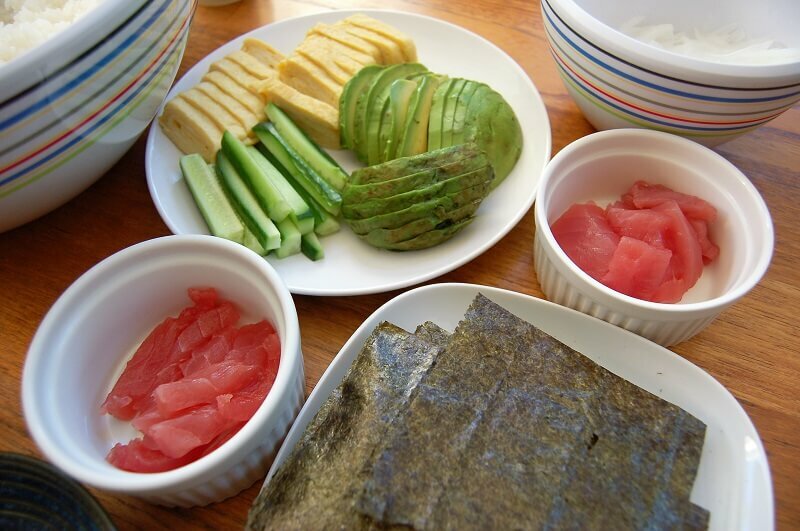 We love homemade sushi, even though the cost is generally higher than our usual meals. Sometimes good food is worth it! Homemade sushi is the best — and it costs a fraction of what you might pay at a restaurant. FI life is rough I tell you! 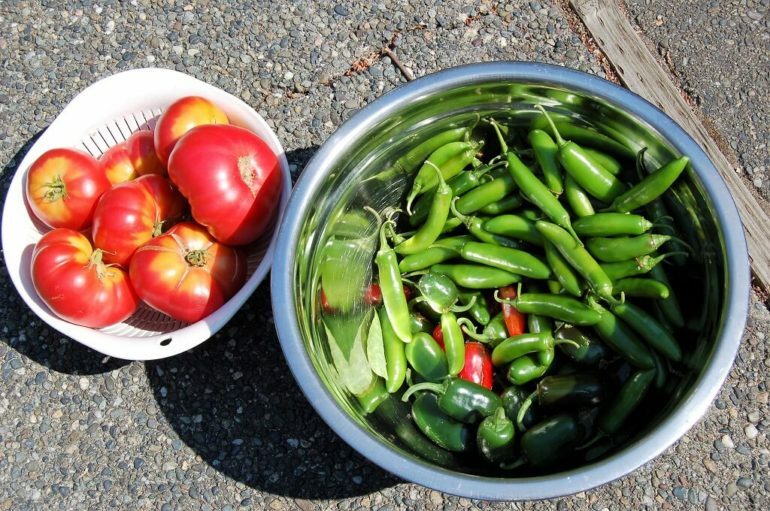 What do you do when your garden is pumping out tomatoes and spicy peppers? Make salsa of course! BIG batches of salsa! We get so much food from practically zero dollars invested — That’s what economic gardening is all about. Our garden might not look like a posh English garden, but it sure does produce a lot of delicious food. Our green-onions (for example) were more than ready for harvesting. What do you do when life hands you a absolutely ridiculous amount of green onions? Roughly 3 gallons worth of green onions harvested from our garden. These were grown entirely from kitchen scraps, and there’s still another batch this size waiting to be harvested. In our case, Mrs. Tako made a Japanese pancake dish called Negiyaki. It’s probably one of the best Japanese dishes you’ve never heard of… trust me when I say it’s awesome! Mouth. Watering. Awesome! Mrs. Tako makes the best negiyaki. Unlike western pancakes this is a savory dish, not a sweet one. It’s generally eaten for dinner, not breakfast. The batter uses a ton of green onions. This time of year the garden is always so plentiful. 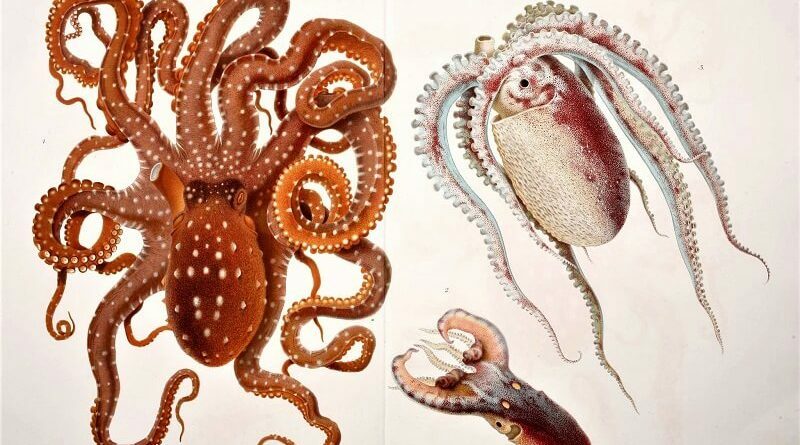 I’m amazed what we can produce from practically nothing. Fuel costs were slightly higher in August, and I attribute this to all the extra driving we did for the road trip. We usually average somewhere around $80-$100 in a given month. Now that summer’s nearly over, I expect we’ll be doing less driving and this expense should return to its former “not terribly high” glory. Mortgage and Childcare expenses are always our biggest expenses for the month — in August they totaled $4,372. This is slightly higher ($32) more than usual because we needed some backup-care for our youngest son during a minor emergency. This was a temporary situation, and this expense shouldn’t show up again in September. While our Mortgage and Childcare are very large expenses, we consider them entirely optional. Because we could eliminate them at any time — We could take the kids out of daycare and keep them home with me (I’d probably have no time to blog), and we could pay off the mortgage with cash. 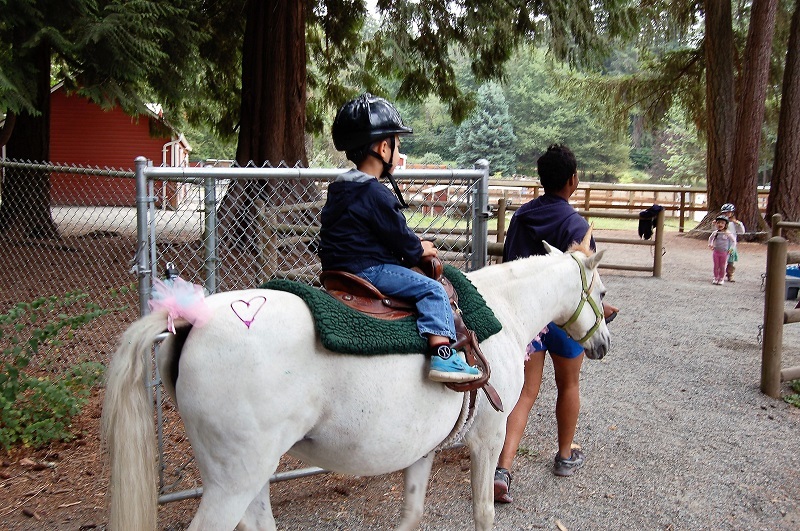 Not everything child-related is expensive — In August our kids got invited to a birthday party with free horseback riding. Win! Internet expenses were our usual $49.99/month for 100mbit service. Yes, this is a promotional price. Normally I wouldn’t bother paying for such fancy 100mbit service, but Comcast offered us this great deal for 12 months. That’s the power of a phone call. I couldn’t pass a deal like that up! When they try to jack-up the price in a year, I’ll either ask for the next promotion or downgrade our service to the slowest speed. Utilities were very high in August at $353. Normally summer months like August are our cheapest utility months, but I needed to meet the spending requirement on a new credit card (Yes, we’re trying out travel-hacking). I prepaid $300 on our power bill in August, and the next couple of months shouldn’t have this expense. 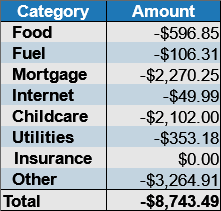 At $3,265, the Other category is where most of the carnage occurred in our August expenses. Why? We bought our tickets to Japan! We started planning this Japan trip back in March, but international flights aren’t cheap — so we decided to do some travel hacking in the remaining months. Points take a lot of time to build, but the biggest wins are in the sign-up rewards. Ultimately we saved about $1,000 on the cost of our flights by travel hacking. The total for our family of four amounted to nearly $3,000. It’s going to be a great trip! Japan here we come! October is going to be our big trip for the year. The Other category also included a few nights in a hotel during our Eastern Washington road trip at $223. There aren’t many good Airbnb places available in Eastern Washington, so a hotel room ended-up being the better option. The expense was $111 per night (after occupancy taxes) for two beds in a brand new hotel. Yes, we could have saved ourselves $20 per night by staying at the ancient flea-bag motel down the road, but we opted for the nice hotel. I think it was well worth a good night’s sleep. Dividends for August were nearly non-existent. 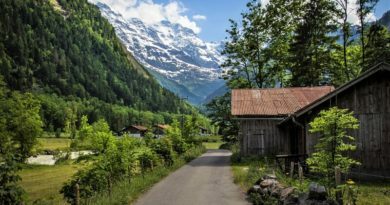 August is one of those off-months, like February, when we receive very little in the way of dividend income. One of the most frequently asked questions I get from readers is if we try to somehow “smooth” our dividend income from month-to-month. No, we don’t. We simply maintain a cash balance for lean months like August. 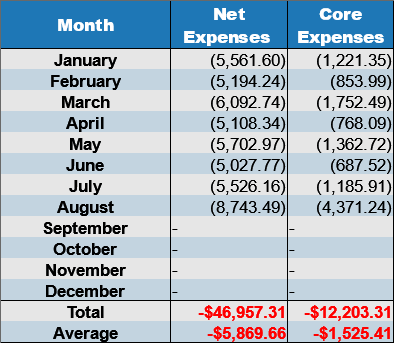 Yes, our dividend income is trailing our expenses this year. I’m behind on my Dividend Growth Plan, and I know it! It’s been hard to find good investments this year, but I won’t force myself to make bad investments for a little extra dividend income. As I’ve always said, “The dividend tail should not wag the investing dog.” I firmly believe that, and refuse to make investments that aren’t in my favor for the long-term. Please remember: This dividend income is from our taxable accounts only. We’re not touching our tax-advantaged accounts at this time. All dividend income in our tax-advantage accounts gets reinvested. The month of August started out well in the sleep department, but just like July I got too busy and forgot to keep track of it. If you’re not familiar with this project, normally this is where I would write about my attempt to get a decent amount of sleep. I’m a absolutely terrible sleeper — I average somewhere around 4-6 hours of sleep per day. It’s not very good for my health, and this project was an attempt to change all that. Unfortunately, life just got too busy in August. We were traveling, I was writing extra guest posts for other blogs, and we had all the usual family summer activities (like swim lessons) to contend with. I didn’t do very well in the sleep department. I probably met my sleep goals less than 12 nights of the month. The month of August included two major investment changes. First, we had a partial call on some of our Ashford preferred shares. When the transaction happens, we’ll get par value for the shares, plus accrued and unpaid dividends in September. If you remember from my post on Preferred Shares, we picked up a ton of hotel preferred shares back during the Great Recession. It was a good time to buy. These preferred shares were on sale then — trading at a 40-50% discount to par value. They turned-out to be a good investment — over the past 8 years we’ve realized dividend yields of 12%-16% on these shares. Unfortunately this party has almost come to an end. Eventually most preferred shares get called, just like bonds. This call on the Ashford preferred shares will have the effect of reducing our dividend income a little, but as a consolation prize I’ll realize around $30k in capital gains. Oh well! The second major investment change in August was a new position initiated in Southwest Airlines (LUV). I wrote about why I made the Southwest investment in a recent post. In short, I think it’s a great company. Basically as long as oil prices remain low, Southwest is going to do pretty well. They have a competitive advantage, good expansion opportunities, and plenty of room to grow the dividend (payout ratio is a mere 14% right now). This investment in Southwest really isn’t an “income play”, nor is it an attempt to predict the future. There are several different potential outcomes for this Southwest investment — If we assume reasonable probabilities for all of these different outcomes, I should do OK for most of them. It’s sortof a “Heads I win, Tails I don’t do too badly” kind of investment — a strategy straight out of The Dhando Investor. There are very few potential outcomes here which lead to losses or bad returns… so I’m happy to buy more shares if the price continues to fall. Oh wow, you did go bananas in August 😉 But it looks to be money well spent! You are going to have so much fun in Japan, no doubt in my mind about that. Think this is also going to be the first time this year we actually “beat” you on the dividend front, but who am I kidding. 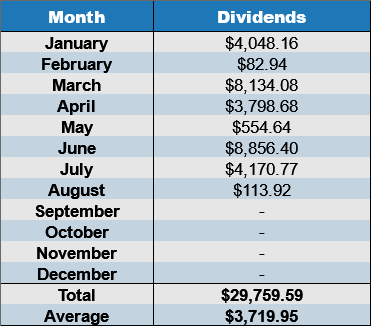 Your dividend income from June alone is more than we will have in an entire year. That being said, you are a big motivator to keep going. P.s. I’m really hungry after looking at your post…..
Keep it up — you’ll get your dividends up to this level soon! I really like that quote “The dividend tail should not wag the investing dog”! I used to chase dividends but realized it didn’t fare well for my portfolio in the long run. Those are some great dividends for the year, and that’s not even your non taxable accounts! Haha- I’m glad you had a great time in August and have a blast with your upcoming trip to Japan! OMG you’re going to Japan! I’ve always been wanting to go but haven’t been able to do that just yet. It’s definitely on my bucket list. I’ve been dreaming about exploring different places and dishes in Japan ever since I was in college. Tickets from the US to Asia are definitely expensive. Our whole family is in China and Vietnam, so we always have to save up and plan carefully before visiting family. We also need to take into account the costs of gifts because we can’t go visit our family empty-handed, and we don’t want to do that. P.S. You have AWESOME food photos as always! Do you mind sharing what camera you use? Thank you! Thank you for the very kind comments Ms. FAF! We actually use a variety of cameras for the blog posts — Cell phone cameras, a Panasonic Lumix, a very old Nikon D50, and I just got a used Sony a6000. None of them were expensive because I buy older used cameras. Most of the photos for this post were taken with the Nikon D50, but I’ll be transitioning to the Sony in future posts. 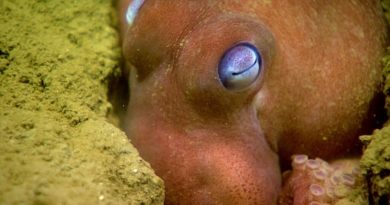 It was a great month, Mr. Tako. I thought you were going to post about how you lost control and spent a ton on something other than plane tickets to Japan. Really!? That’s a good price. I have only flown through Japan but have gone to South Korea dozens of times. I’ve noticed that the prices are highest during the Summer, significantly. One perk of retiring from the military is Space-A (available) Travel for a small fee. I can fly with my family as a retiree when space is available. The challenge will be finding flights that are not fully-booked so we’ll travel during off-peak seasons when I decide to stop working and fully retire. That’s an incredible military perk! Congrats! Slight over $3000 for 4 ppl going to Japan is pretty decent. Saw a few flight deals with ANA the last few month. We’ll probably do a trip to Japan again once Baby T2.0 is a bit older (Baby T1.0 went when he was almost 2 and now he barely has any memory about Japan). I’ve been wearing my Fitbit at night to track my sleep. It’s amazing how little sleep I’ve been getting (with getting up for kids and such). Hopefully I will get back to ~7 hours soon. One final thing, totally awesome for the home-grown produce. They taste so much better than store-bought IMO. I love picking fresh tomatoes from our green house. I’m always impressed how low your food costs are and yet your family still eats gourmet… love it! Japan sounds like a wonderful vacation with the family. It’s still in our bucket list, so I’ll be interested to hear about your travels. We’re probably a few years out from taking that trip, but Thailand is likely in my near future. 🙂 Thanks for sharing! I always look forward to reading your updates, Mr. Tako. Man, that negiyaki looks amazing! I also clicked over to read the economic gardening post that I somehow missed initially. Having a garden for by boys to help with, and learn from, is high on my agenda, so I look forward to your tips. Wow, you’ve been reading since Hawaii? That’s fantastic! Thanks for being such a dedicated reader Cody! Yes, Sir. I looked back through your archives and I think I subscribed sometime last January or February. 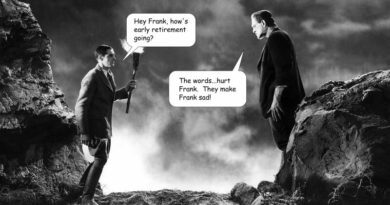 Yours is one of the first early retirement blogs I subscribed to and I am so glad I did. I truly appreciate the work you do here and always benefit from reading your articles, even if I’m not able to comment on each one. Homemade sushi!! I’m going to try that next time I’m on the coast. But it’s going to be less of a ‘meal’ and more of me with a chunk of salmon, eating it from my hands 😛 Lovely food, and have a great trip to Japan! I’m so very jealous of your green onion harvest. ^ that has got to be the most Asian thing I’ve said in a while. But I am. The green onions in Washington are 3 small bunches for $1 on sale. Planting your own sounds more delicious. I keep forgetting to pick up Japanese mayo. I haven’t seen fish/bonito flakes at my local market…I wonder what section they would put that in. I’m craving tako yaki. I’m actually surprised your food expense is so..low! I thought eating like kings meant over $800! Excellent frugaling! Hey, a fellow Washingtonian! Yes, food can be expensive here. We’ve always grown our own green onions… it’s really easy and they take practically no care. We actually spent WAY too much this month on food. Usually food runs about $500 per month for us (or slightly less). Things got a little crazy. 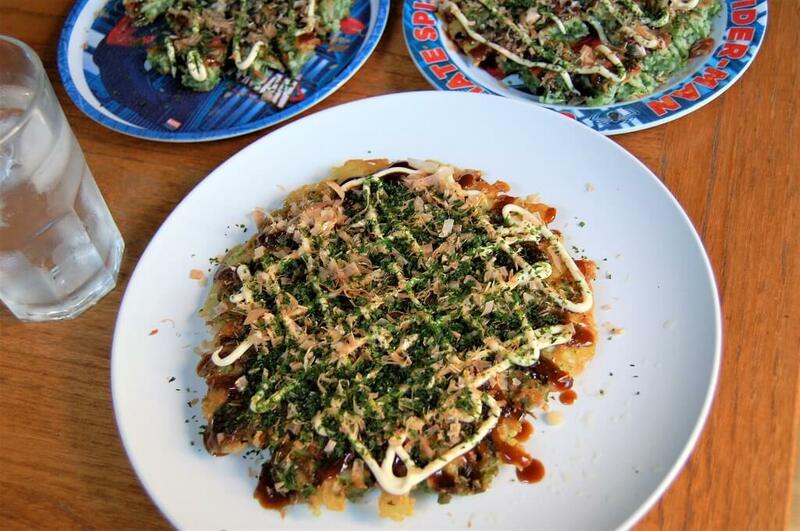 Negiyaki looks just like okonomiyaki. I’ll have to try to make it soon. Thanks for sharing new Japanese food. Your trip will be awesome. I can’t wait to read more about it. Where will you spend most of the time? I think it’s great that your kids go to an immersion program. Are you going to continue once they’re in school? In Portland, it’s not too difficult to get into a Japanese bilingual program at our public school. Most people wants to put their kid in the Chinese and Spanish program. It *is* really similar to okonomiyaki. I actually prefer negiyaki over okonomiyaki… it tastes better! There’s definitely more vegetables in it! We’ll spend most of our time in the Kansai region – Osaka, Nara, Kyoto, and Wakayama. It’s a region famous for good food (and coincidentally the origin place of okonomiyaki). I wanted to go down to the Kagoshima area this trip, but it sounds like there’s been significant flooding in that area. That said, I wouldn’t be Mr. Tako if I didn’t have a couple surprise locations planned! As far as the language programs go… Yes, we’ll to try to continue it. I believe that globalization is definitely going to continue in the future, and the most “globalized” individuals will see the best opportunities in future decades. Even in our area, many companies are *already* looking for job candidates fluent in 2 or more languages (on top of technical skill requirements). This will only continue. I’m not certain what language programs the schools have available, but our house definitely requires fluency in two! That sandwich looks amazing! I think sooner rather than later I’ll need to up my internet speed. We have a lot of devices connected with smart TVs and all. So a phone call to the cable company is in the foreseeable future. 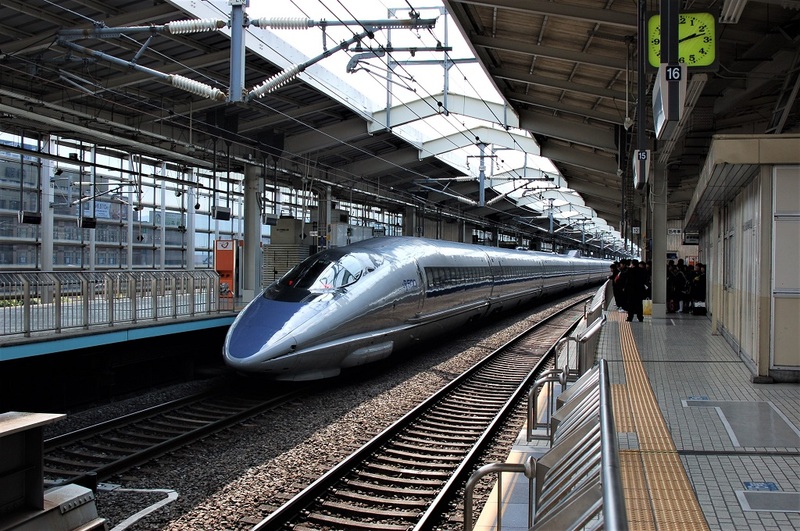 All the best on your Japan trip….and the Southwest investment! Oh man, that home-made sushi looks SO good! And he Japanese pancake too! Why would you ever need to eat out when you can cook like that? Where do you account for things like toiletries in your expenses? Is that in the other category? Great blog btw!!!! Generally that stuff falls under “food” because we buy it from the grocery store. It could also fall under “other” depending on what it is. Great site.. found via your guest post on DGI. I was looking at your archives and menu, I don’t see a page that shows the stocks in your portfolio. Is there one? I routinely talk about many of my holdings (see the recent post about LUV), but for personal reasons I don’t list them all.